Minishogi is a game information page. It is categorized as: Orthodox chess, . Author: Hans L. Bodlaender. Inventor: Shigenobu Kusumo. Minishogi, one of the smallest variants of Shogi known, was suggested by Köksal Karakus as a recognized chess variant. He writes: "I want to tell you that Minishogi should be one of those variants that are recognized. Because it is a small but very playable variant. Although Shogi still stands very complex, minishogi is simple to learn, has basic rules, but still has something to fight with your opponent." 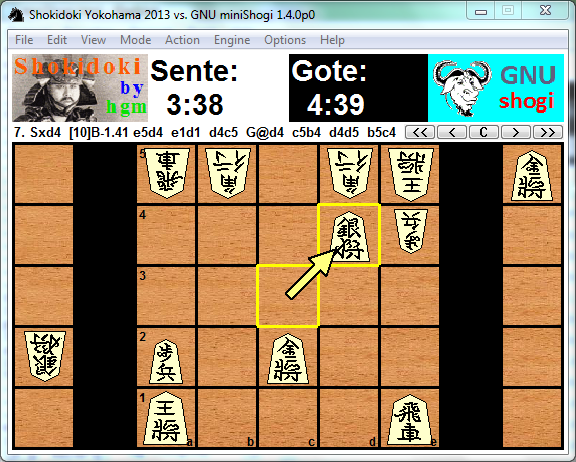 Click on the above link to view logs of Minishogi played on Game Courier. All pieces (except King) are present twice for each color, so you use an entire Chess set except for the Queens, Knights and two Pawns of each color. Six of the Checkers of each color are fixed 'permanently' to Pawns. Each player has (on his side of the board) two sets of pieces: the 'hand' with pieces of his own color, and the 'stock' with pieces of the opponent's color. Initially all pieces not needed to set up the initial position go into their respective stock. When a piece is captured, it goes into the stock of its color (controlled by the player that captures it), and the opponent gives the player that made the move an identical piece (of opposite color) from the stock, to go to his hand for dropping. The captured piece is stripped from any Checkers that are not fixed to it: the Checkers go onto a heap next to the board, so both players can grab one of those of either color, when they promote a piece. To promote a piece, you slip a Checker (from the heap) underneath it. Bishops turn into Horses, Rooks into Dragons that way. A Silver, which already is a Pawn on a Checker (of the same color) turns into a Gold (which already had two Checkers of the same color). To keep the difference visible, you could slip a Checker of the opposite color underneath the Silver. To promote a Pawn, you put it on top of two loose Checkers, so that it also takes the shape of a Gold. To keep it uniquely recognizable as a promoted Pawn, you can take both Checkers of the opposite color as the Pawn. Perhaps it would be good for consistency (and visibility) to always use Checkers of opposite color to promote a piece (so also in the case of Bishop and Rook). The same system can be used to play Judkins Shogi. The only imperfection there is that a promoted Knight, represented by a Knight on a Checker, now does not look the same as a Gold, while it does move like one. Well, I am not the author of Nebiyu, so this is hard to answer for me. From inspecting the alien.ini file I get a fair impression of how it is used: there is a section where you can define piece types and their moves. And there is a section where you can define games by specifying which of the defined pieces participates in them, how they promote, what the initial setup and board size is, etc. I have never tried to define a game there from scratch myself, however. I quickly looked up the rules of Tori Shogi, and it seems it should be possible to play this under WinBoard as variant shogi with modified board size and pieceToCharTable. Only 6 different piece types can be in the hand, and this does not exceed the number of board ranks. (This would be a problem in Wa with drops.) You would have to make a WinBoard settings file tori.ini similar to mini.ini in the mini-Shogi package, to configure WinBoard for Tori Shogi. Obviously you would have to change the board size specs to 7x7, with holdings for 6. The tricky thing is always the /pieceToCharTable; here you would have to define which WinBoard symbols you would want to use for the various Tori pieces, and what one-letter ID to assign to them. Those that can promote should be in the first eleven, and 11 places later a + should be defined to indicate it can promote. For non-promoting pieces you could use any of the 22. WinBoard won't have pieces that would move as irregularly as some Tori pieces; therefore you would always have to switch legality testing off. WinBoard has independent definition of how pieces move in Shogi and in all other variants, but in Shogi currently no move is defined at all for piece types that are not occurring in Sho Shogi. Perhaps in a future WinBoard version I should define some of these as having the moves of Tori pieces! People can always define external bitmaps for them. Pardon, please. I only prove my dimness. I think I should have written alien.ini of Nebiyu. Dear Dr. Muller, Thank you for preparing these Winboard shogi modules. I wonder, do you think that it is possible to add tori shogi to one of them? I have been trying to figure out how to modify the alien.ini of Nubati engine on the hopes of trying this game via WinBoard, but, as with my attempt to do the same thing with hiashatar, my very dim knowledge is a great obstacle. I have very much enjoyed HaChu, I should write, too. Best wishes! I now collected all free engines that could play mini-Shogi using a standard protocol in a single software package (for MS Windows), bundled with WinBoard as Graphical User Interface. Installing it would create a menu group in the Windows Start menu, containing items to start WinBoard for mini-Shogi, and for (6x6) Judkins Shogi (both with western or oriental piece representation). Starting WinBoard this way for mini-Shogi allows you to select from 7 different engines of widely varying strength. You could use these to play agains, analyze your own games, or have any two of them play against each other. Included are the engines Shokidoki, Nebiyu, TJshogi5x5, Lima, Deep Nikita and GNU minishogi, while a download link is provided for Petit Shogi. Only Shokidoki, Nebiyu and Petit Shogi can play Judkins Shogi.